Also starting from Oct 19 the camera will be closed for the nights. The operation time will be 6:00 - 20:00 (6 am - 8 pm) local time. The Youtube stream can be scrolled back in time four hours from present. This way it is possible to see what happened at the nest a little earlier. This makes it also possible to record the stream with some screen recording program. From the Settings-button in the lower right corner one can change the resolution of the picture. The WTE camera is not on the top of the list so you need to scroll down a little. In Latvian it is called "LDF Jūras ērglis tiešraide". 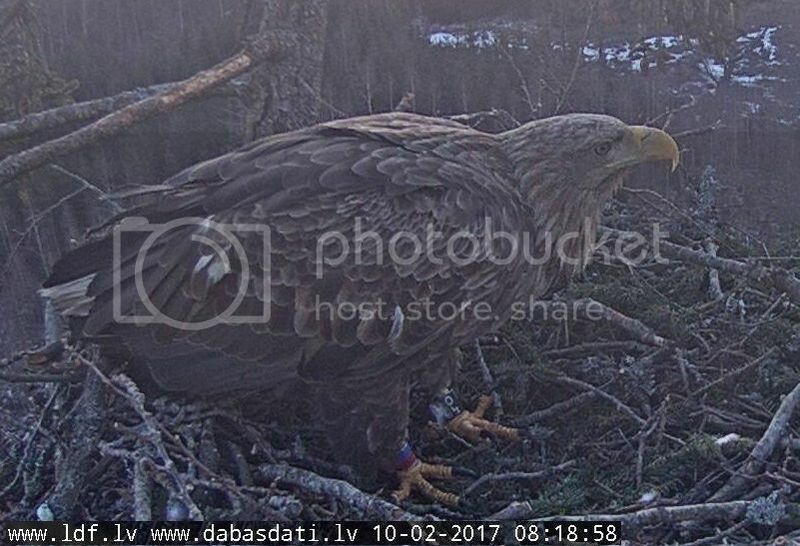 The Latvian Nature Fund (Latvijas dabas fonds, LDF) keeps a picture and video archive for the nest cameras which it is operating. The similar archive for Looduskalender cameras is called the Pontu archive but the Latvian archive has no special name. Both archives work with the same principle. The stream is recorded and the videos are saved in this archive. Also a high-resolution still picture is taken each minute and saved separately in video and photo directories. The videos and pictures of 2017 are being saved in the same archive at least presently. Scroll to the bottom of the list. All other values than the year are given with two digits. Note that the date appears in the address twice. Also note that the address is case sensitive: for example an address with 'Jpg' as format will not open a picture. Editing the date and time correctly will open the desired archive picture. If the picture is not found even for a seemingly valid address the time may be too early or too late: pictures are taken and stored only in the light time of the day. It is also possible that due to technical difficulties some pictures are simply missing. In the above the first letter f in the beginning of the address has been replaced with a * so that the address can be copied from here. Clicking the name of any video in the folder will open the video either for playing (not recommended for these large files!) or downloading (this will take a long time, too). The videos are in mkv (or the so-called Matroska) format which the VLC player cannot re-record or even play properly. The Potplayer can handle videos in this format. The free version of Solveig AVI Trimmer cannot be used for trimming the archive's mkv-videos but it can handle the videos recorded with the Potplayer in mkv-format. Before starting to download (save) the latest video from the archive one should check that it not being recorded still. If the video is still being recorded the file will be without an end-marker. Downloading such a file gives an incomplete and probably (partly) unmanageable file. Refreshing the archive bookmark after a minute or two later will show if the recording of the file has stopped: the "last modified" time of the file will not increase any more. The resolution of the videos is so good now that the high-resolution 1-min-pictures have become unnecessary. Only videos are saved. or ask ame or Liz01 for assistance. The archive was made non-public from 14.5.2017 onward. The data is being saved but there's no direct public access to it for now on. In the early season the nest was again, like in the previous year, visited by many strange eagles. Some of them only made brief visits, but some tried to settle to the territory. This lead to several successive struggles and fights between eagles. Several dating pairs were formed and soon broken as results of these confrontations as new girlfriends and/or boyfriends replaced the previous ones. As a results of this pair-changing carousel a male called Raimis and a female who went unnamed for a long time remained in the territory and formed a dating young couple. Raimis came to the territory on 3.3.2017 and took charge. He had two girlfriends one after the other before a new strong female banished the last girlfriend on 7.4.2017 and stayed. Only in the Autumn the Dabasdati people were certain enough that she would stay and they gave her the name Milda. Raimis tried hard to mate with Milda in the spring but no breeding resulted. However, the eagles settled on the territory and in October they began to rebuild the nest. They continued their work regularly till December but then they started to rest from the building for the darkest time of the year. Anyway they visited the nest almost on daily basis. The season 2016 started with misfortune: Durbe was never seen again after Dec 29 2015. Instead of her Robert got other company as a young strange female tried to make his acquaintance. Also other strange eagles began to visit the nest. Sometimes there were clashes among these eagles when more than one happened to come to the nest at the same time. Some clashes must have taken place outside the nest, too, since Robert injured his foot somewhere. It became apparent that something fatal had happened to Durbe. Robert didn't warm up to the advances of the new female and finally he had to leave. He hasn't been seen at the nest for certainty after the end of February. 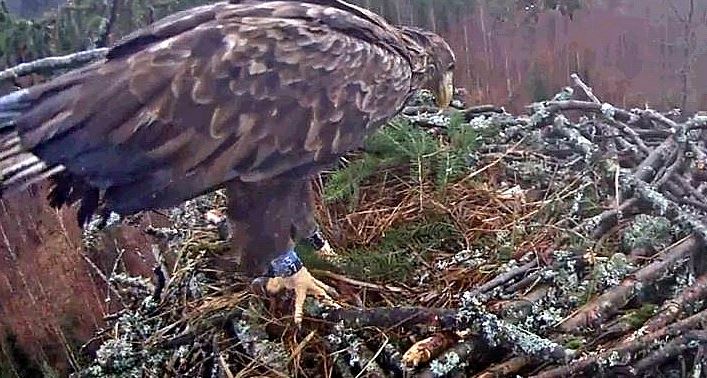 During the spring more strange eagles visited the nest, among them a young female and a young male who started coming together. They seemed to settle at the nest so after a while they were given names Egle and Ansis by the DD members. However, they didn't quite seem to be mature enough to breed yet, although the male was very eager to try to mate with the female (but his technique was not adequate yet). After a month or two they stopped coming and were not seen at the nest after the end of April. 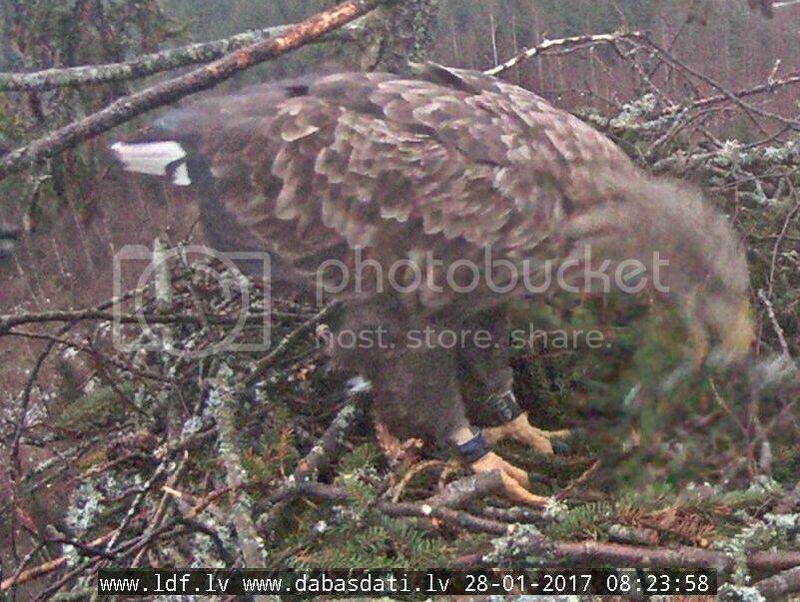 On April 17th a Latvian eagle with number 221 on its blue-over-black country ring on the right leg and individual code C602 on the blue-over-white left ring was identified on the nest. Probably the same bird was seen already on March 29th but then only the first two characters on the blue stripe of its individual ring, C6, were seen. 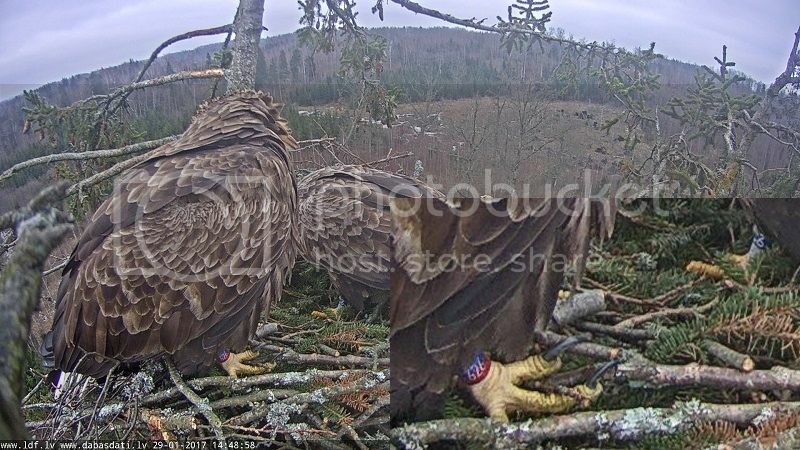 C602 was ringed on 5.6.2010 in Kurzemē region (Kuldīgas side) in a nest with two eaglets. This eagle began to visit the nest on a more or less regular basis. 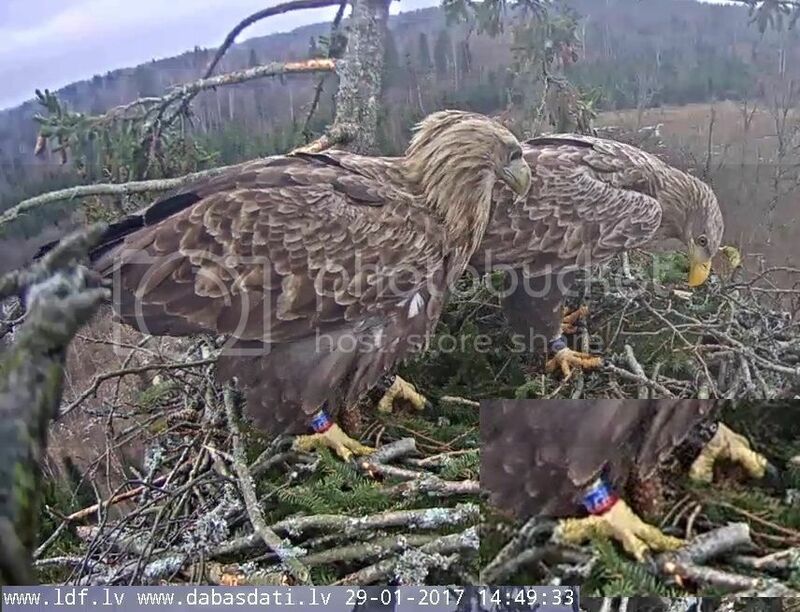 On July 29th a Lithuanian eagle with blue-over-red country ring on the right leg and individual code B556 on its black-over-blue left ring arrived together with the Latvian C602. B556 was ringed as a nestling on 30.5. 2009 in Šilute district, Lithuania by Deivis Dementavicius. The bird was earlier captured in a picture taken with an automatic camera on 30.9. 2011 at a nest in Kurzemē (Tērandes side), Latvia. From the end of July the two eagles started to come to the nest together. Based on their voices it was concluded that C602 is a male and B556 is a female. They seemed to get along well from the very beginning: for example on one of their arrivals on that day they landed on the nest simultaneously "hand in hand". In the picture below the Lithuanian B556 is in the foreground and the Latvian C602 is in the back. In the autumn they began to rebuild the nest. On Oct 16th the female was given the name Šilutė and the male was named Vents by the members of the Dabasdati forum. Šilutė is now 7 years old and Vents 6 years so it is probable that they will breed for their first time in this season. During the summer and early autumn the friendship of these birds grew and the prospects of getting a fruitful season 2017 at this nest became brighter as the autumn grew darker. 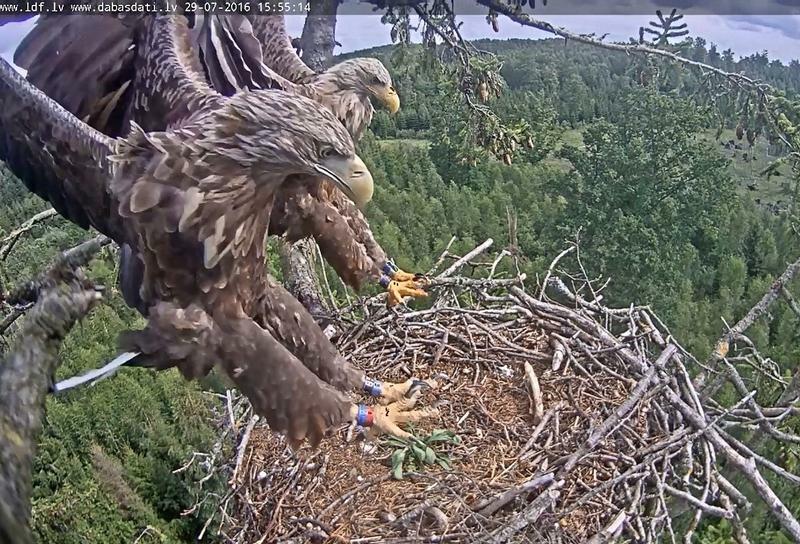 The eagles started to bring sticks and twigs to the nest. The female Šilutė has been the more hard-working partner in this respect. They also began to show each other expressions of tenderness in the eagle way, pulling each other's feathers and pecking each other's faces which in human eyes looks rather scary but must be the eagle equivalent for kissing. Vents has been the more active partner in this activity. He also often sings softly to his sweetheart. One or two attempts of mating have been observed during the autumn. 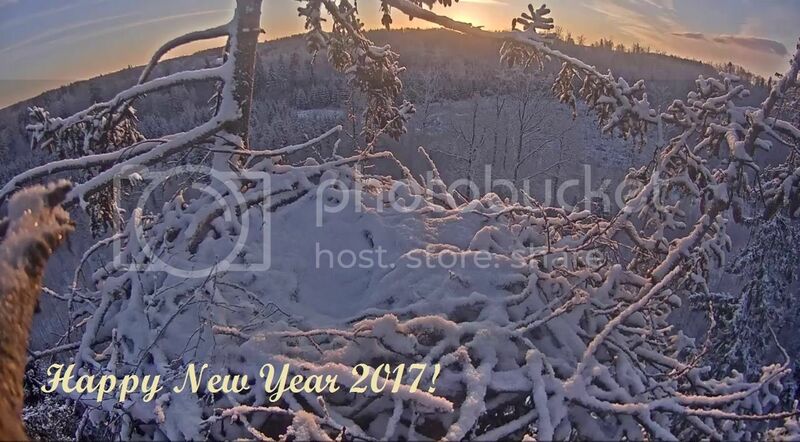 In the beginning of the year 2017 the construction of the nest is already very complete. 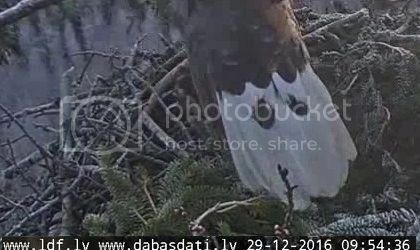 Complications arose as Šilutė was not seen anymore after Jan 27, when she left the nest together with Vents at 10:50. 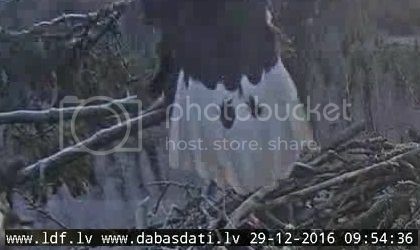 The next day both eagles were absent and on Jan 29 Vents returned alone and waited at the nest for a long time. A young Lithuanian female L076, possibly Šilutė's full sister was seen on the next two days together with Vents. On Feb 1 a youngish but mature-looking un-ringed female came to the nest together with Vents at 9:33. 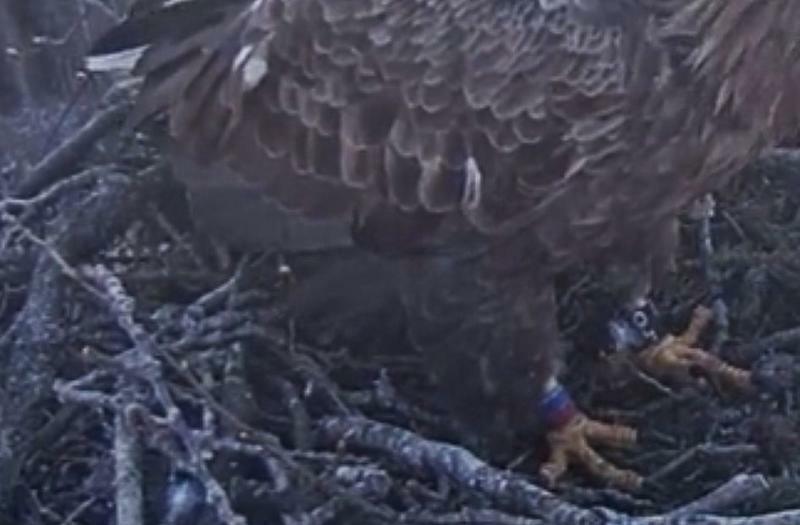 She seemed determined to take possession of both the nest and Vents, but so far (Feb 10) it is unknown what will happen. The spring at the nest was very lively, like in the previous year. Raimis and Milda are now the owners of the territory and they have started to rebuild the nest for the coming season. 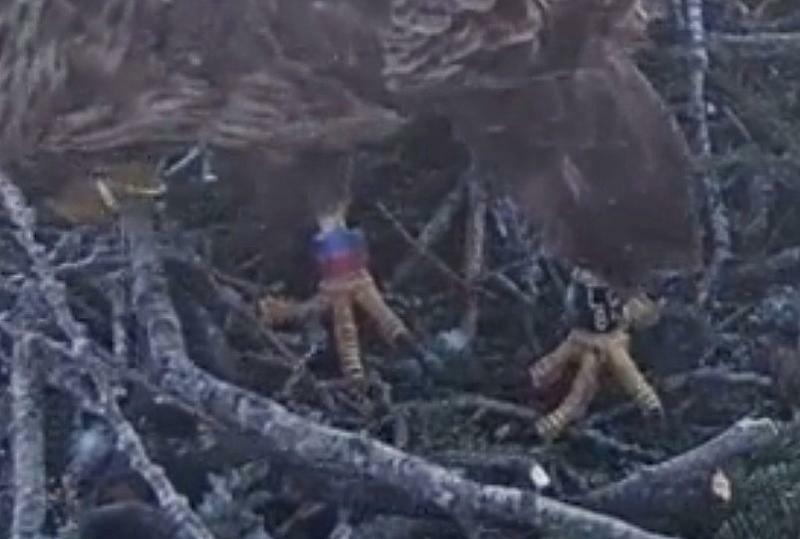 Knowing who is who on the nest should not be a problem now that both of the inhabitants wear rings. The female Šilutė has the Lithuanian ring with blue stripe on the top a red stripe on her right leg and a year 2009 ring with black stripe on top of a blue stripe on her left leg. The male Vents has the Latvian blue-over-black ring on the right leg ant the blue-over-white ring of year 2010 on his left leg. Seeing at least one leg is therefore enough to know exactly who is who. This works in principle but in the poor light conditions of the darkest midwinter this has sometimes proven to be not so easy. Their tail spots form different patterns but it cannot always be very clearly seen. Šilutė has two separate black spots and the left spot looks slightly bigger because it is formed of two feather tips. The spots in the tail of Vents are smaller and they form a horizontal line. One spot on the right side in the tail of Vents seems to be larger and be higher or lower than the others because it consists of two tips of feathers. He also has long black lines in the edges of the tail (like a 'mustache' or 'icicles'). The edges of Šilutė's tail are white. Otherwise the outer appearance of the eagles is very similar as they are almost equally old and equally big. The female Šilutė on the left (at 9:54) and the male Vents on the right (at 10:46). On the whole Šilutė's tail pattern is clearer and more regular than the pattern on Vents' tail. Here's a gif showing Šilutė getting up to the branch. Here's a gif showing Vents getting up to the branch. The location of the nest is in Durbe County near the city Liepāja in Western Latvia, marked with blue line in the maps below. The maps were provided by Jānis Ķuze. We may get some clues about the location of the nest from what we see and hear over the camera. Based on these clues it is possible to narrow down the location of the nest in more detail. We ask every one of you to keep all detailed information about the location to yourselves. Please also do not share any further information about the location anywhere in the internet, not in this forum nor anywhere else. More detailed information of the location of the nest may encourage some people to go and seek the nest in nature. Nest tourism like this is the last thing that is needed here in the delicate breeding time. People near the nest may frighten parents away from the nest and leave eggs or chicks unprotected from weather and predators. Thus an intrusion may lead to destruction of the clutch. Apparently the picture is taken from the direction to which the nest camera looks. 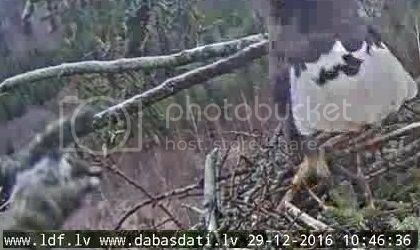 The live camera topics are under the title "Tiešsaistes kameras Latvijā" and the WTE -topic is called "Jūras ērgļi Durbē 2017". The language of the DD forum is Latvian. You can try your luck with some translator machine to communicate there. Most of the Latvian members understand English, too. Some of the DD members are members in LK, too. One can search for weather information for using Liepāja, too, since it is the closest larger city near Durbe. 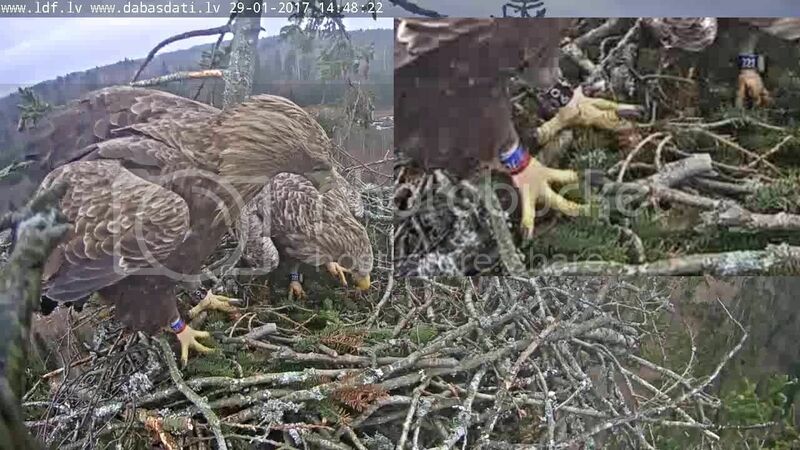 Observation system at the nest place helped Janis Rudzītis (SIA "Rewind", system configuration) and Girts Strazdiņš, its maintenance have helped Maris and Leo Dabasdati.lv of the Forum, as well as van Drongelens Leks (Lex van Drongelen) and Jelle and Lips. Data transmission 4G network provides LMT. On that visit the ring reading remained, however, unclear. 29.1. Lithuanian L076 ringed by Deivis Dementavičius in Western Lithuania on 9.6. 2013 in the same breeding territory as the female of this territory Shilute who was ringed on 30.5. 2009. L076 may even be her full sister. In the archive picture take at 14:48 the number 626 can be seen. L076 visited the nest again on Jan 30 in the morning. In the archive picture taken at 8:21 the letter L and the middle number 7 under it can be clearly seen. L076 visited the nest again on Jan 31. It showed apparent interest in the male Vents. L084's profile and rings in the archive picture taken at 8:18. 24.3. Latvian K055 visited the nest for the 10th time. Its previous visits have been on 22.12. 2015, and in 2016 the days were 3.2., 13.2., 13.3., 15.3., 28.4., 16.8., 21.10., and 30.10. 25.10. 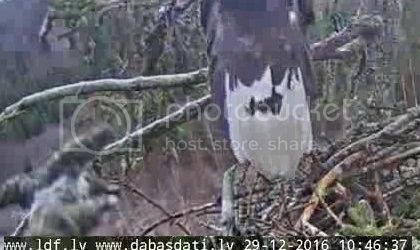 Latvian K055 visited the nest for the 11th time. On the country ring he has the code H321. 8.12. Latvian K091. On the country ring she has the code H357. Jānis Ķuze ringed this bird on 28.05.2014 as an only chick in surroundings of Liepāja city, SW Latvia. 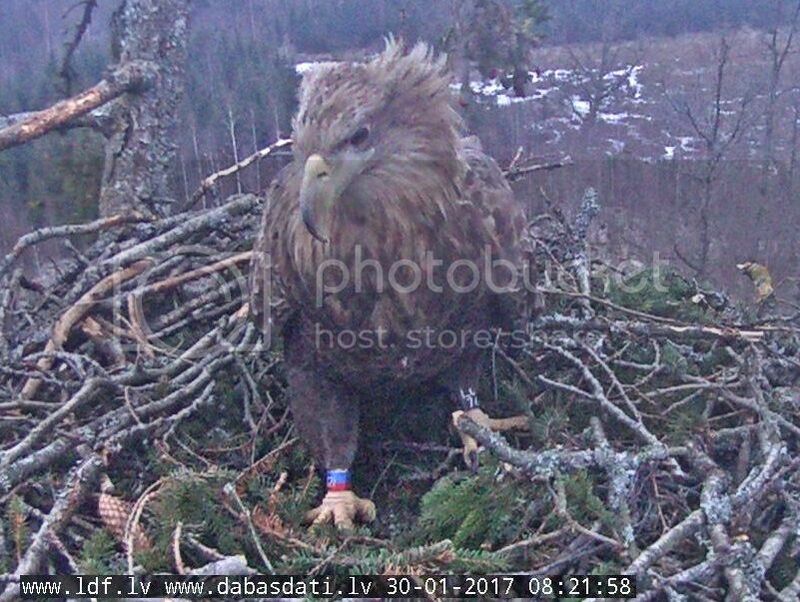 Interestingly, it comes from the same nest as K019, seen here on 28.01.2017. This is the first control sighting of this bird. Therefore keywords for making searches for finding the answers are added in the posts containing the answers. Below is a list of these keywords. This list will be supplemented as new keywords are found useful. the scenery is sooo far from the picture which i put on the top. the picture&video archives are still the same 2016-archives as they were. Every day I read you and look at your photos and at videos, a real happiness! Thank you all and all as well as teams of scientists who allow us to share the life of the eagles. Vērotāja has also started a new topic in DD for this year. the introduction is in Latvian but GoogleTranslator (GT) makes rather good sense of the text (although camera is again sometimes translated as 'chamber' ). i made a picture of Tringa's photograph taken of the nest tree where i marked the branches which we can see in the camera. the photograph was taken before the camera was installed. the picture shows the tree from the direction where the nest camera is looking. therefore the branches which we see in the live camera on the left are on the right side of this picture. one special branch is also shown: the "poop branch". the name came naturally since Durberta hit this branch very often with her poopshots. by the end of the season 2015 it was all white. it's a small surprise that the branch is still alive. 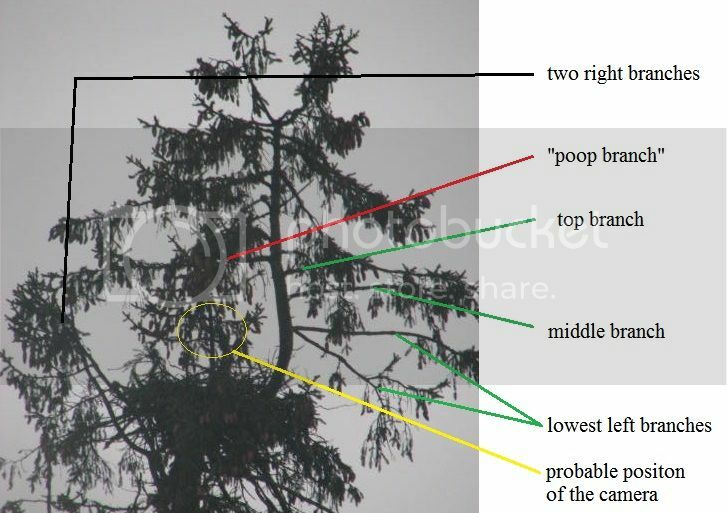 the poop branch also frames the top of our camera view. i have also drawn an ellipse on the place where i think the camera is most probably attached to. this is a quite valid remark: a pile of sticks this big also weighs a lot. but this is a very new nest, it has been built only in two springs. it is known that some eagle's nests have been in use for decades. every spring new material is brought to the nest and it will grow bigger every year. finally the nest may become so heavy that the tree simply collapses under the weight. usually this happens in the winter when snow on the nest adds weight. the nest bowl is about 20 cm - 45 cm in diameter and about 10 cm deep (Willgohs 1961). btw: i suppose that eagles "know" what they do in building their nests. unfortunately this does not always apply to humans. in Turku a new hospital is being built on top of a four-lane highway and two-lane railroad. soon after they had started to build the foundation pillars for the building it turned out that the concrete which they used was too soft and brittle. now they have to tear everything down and start the building work all over again. while i was writing it became dark at about 5 pm.